When I was growing up, I lived across the street from a small patch of woods that was part of a local park. The park itself was, at most, a five-minute walk from my home. It was my favorite place. Very few people walked the paths in the part of the forest where I wandered. I knew kids would go there; beer bottles and some trash appeared now and again; it was somewhat obvious that there were areas that served as teen hangouts. But I never actually encountered any of these folks, and the place nearly always was empty of humans. It felt as my own. As others before me have said way better than I ever could, I went to the woods to seek solace. I could sit in the quarry--a rocky area within the forest that was never actually quarried, I'm sure--for hours. 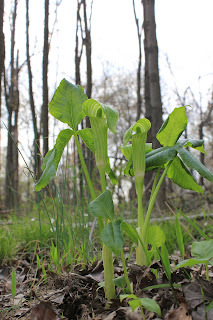 I saw may apples and skunk cabbage, and watched insects. I remember being thrilled when a ground hog came ambling through. I let birdsong enter my consciousness. Many years later, when I was able to purchase my first house, one of the most important aspects of the location was that it be in walking distance to at least a patch of woods, if not an entire parkful or forest. 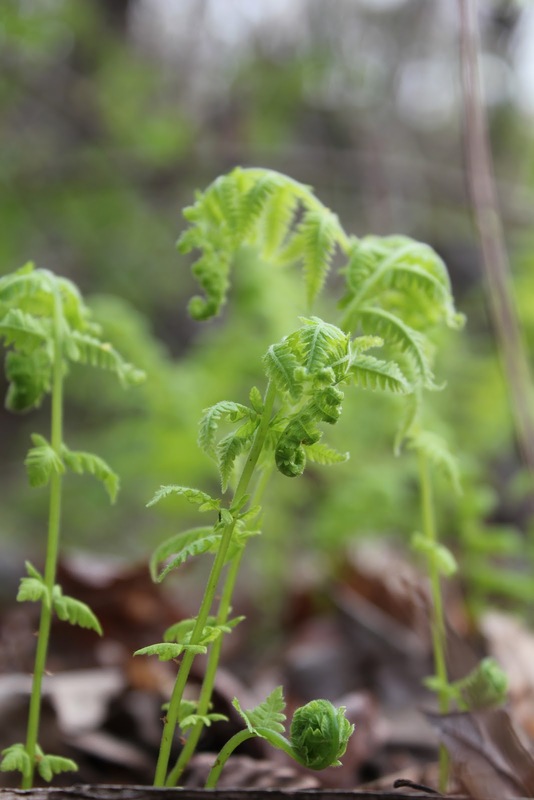 And when we moved into our current home, I felt like I had my own little bit of heaven, since about 1 1/2 acres of our property is woods that are almost contiguous with several hundred acres of wooded county parkland. I still am in love with my forest; I walk it whenever I can, nearly always with camera in hand. And perhaps because of my early love affair with the woods, I see many things in our small area as I traverse the barely distinguishable path that we've gently crafted. Sometimes I take the dogs when I walk in the woods, but not if I plan to take pictures or look for wildlife. The pups love it when I take them, of course--so many interesting smells and sounds. Come walk with me and I'll show you some of what I see. In today's post, I feature just some of the amazing diversity of plants and flowers. I don't know the names of all of them, but that doesn't impinge on my appreciation. All of the pictures below were taken over the course of just a few days this month. The forest never stands still; there is always something new to discover. To get to the wooded part of our property, you need to go through a gate. The deer fencing we've put up ensures that the plentiful deer get to stay in their neighborhood, and I get to have a perennial garden. A wildflower of some sort (surely others would call it a "weed" greets you at the edge of the gate. Just outside the gate, more of the same flowers grow. Several types of wildflowers grow here; on the edge of the woods, these plants receive a little more sunlight than those deeper within. Many wild violets grow in the forest. These wind up in my perennial garden as well, and I let them stay, as their purple blooms offer early color. 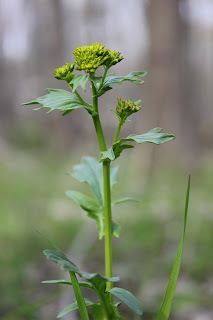 Probably another "weed," this yellow flower seems elegant and simple. I have yet to identify everything in the woods; sometimes I think it's better that way; I get to enjoy something just because it exists, not because I know it's name. I'm pretty sure this is wild honeysuckle, a New Jersey native. 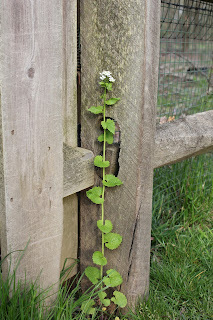 This also appears in my perennial garden, where I transplant is along my fence to create a living border. Sometimes things are interesting simply because of where they are. Here, seedlings of some sort found a lovely natural planter in fallen log. When woody vines fall die back or fall, they leave curvy patterns for the eye to discover. 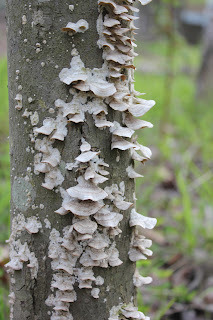 Shelf lichen adorns a tree. Sometimes you'll encounter a whole trunkful. 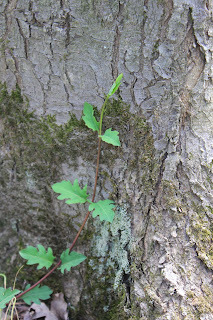 And other times, just one nearly encircling a sapling. Sometimes you discover that what you thought were different plants were really the same species at different life stages. 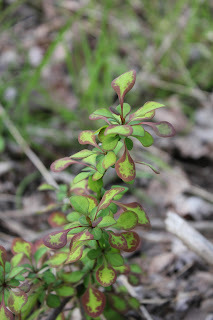 I thought this little seedling was adorable; the colors unusual and quite decorative. Here's another version--maybe a year or two older. I've always thought it fascinating that early spring is a preview of fall; young leaves sprout in the same autumnal colors before they turn green. Same plant, a few years older. Gorgeous little yellow flowers--and lots of pointy thorns. Pretty now, but you can't walk through a bunch of these bushes without a long-sleeved jacket and pants for protection against scratches. It's not all about color either. These are Jack in the Pulpits. 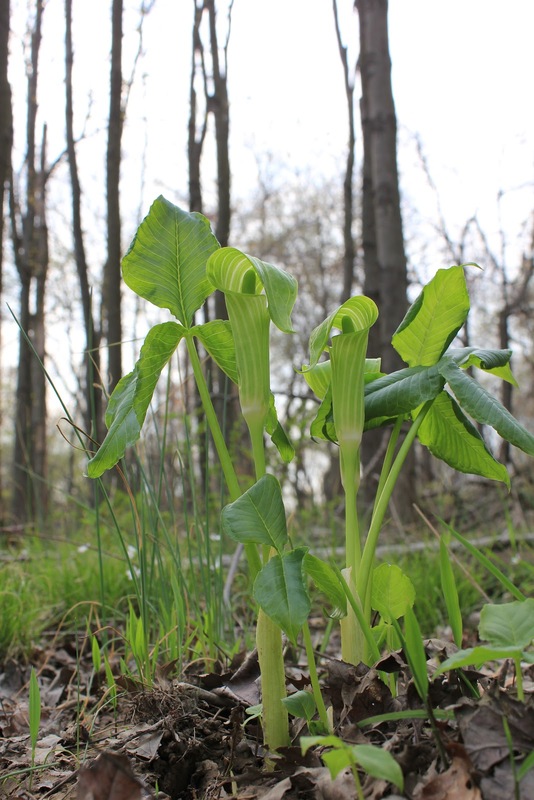 Another New Jersey native, these don't bloom until they are several years old. I am such a fan of ferns. I love how they unfurl in the spring. Along with the Jack in the Pulpits, I have transplanted several ferns to my front yard, in an attempt to include native plants in my landscape beds. It looks like they're coming up this year, which makes me quite happy. Flowering trees also make an appearance in the woods. Here a native sweet crabapple blooms. I like seeing these in the woods and knowing they provide an early source of pollen for bees and fruit for birds and squirrels later in the season. 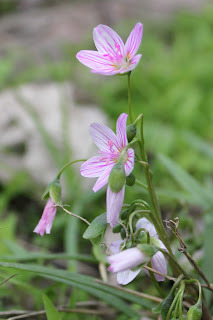 I think my favorite wildflowers are spring beauties. Each year, more grow in our woods, adding lovely pink accents throughout the forest flower. I've tried to transplant these to our front yard beds as well, with limited success. 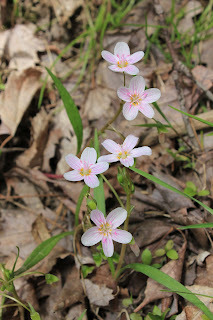 A closer view of spring beauties. They seem to have a color range, with some featuring a showier, more vibrant pink. Since the dogs aren't with me when I take my photo tours of the woods, there is always some kind of welcoming committee waiting for me at the gate when I come back. And usually, hoping that they get to come with me next time. 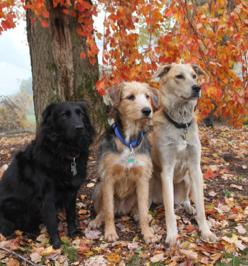 At the gate: Lilah, Jasper and Tucker waiting for my return from the woods. In my next post, I'll feature some of the wildlife I encounter on walks in the forest. While there are plenty of nocturnal creatures that I'm not expert enough to capture in a photograph (opossums, raccoons, flying squirrels, skunks and owls to name a few) and other animals who are a little shy (such as foxes), there are still plenty to see.